It is fascinating to see the difference between the Playa Flamenca supermarkets, and our shops at home. Some of the fresh food, including meat and fish is astonishing. Take your food and drink phrase book as it can be quite hard to identify some things, cuts of meat are quite different. I suppose this is the same in all Spain so if you have been to other parts of Spain you may already be familiar with this. Food is much cheaper than in Britain, you will be pleased at the size of your bill. Many of the staff in supermarkets are Spanish, so bear that in mind. You can always see the total price at the check out till. The mini marts tend to be run by British people so language is not a problem. They often stock British brands too so you will recognise things. In some large shops, you cannot take big bags into the store. You must leave them in the lockers. You need a 1€ or 50 cent coin – you get it back when you retrieve your possessions. Supermarkets are usually closed on Sundays but the minimarts are open, some with shorter hours than the rest of the week. Some of the supermarkets are open on Sundays during July and August - check at the shop. 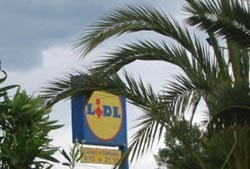 Lidl is on the Alameda del Mar roundabout. It is the same style of shop as Lidl in Britain. It is cheap, sometimes amazingly so, but has a limited selection. I bought a bottle of gin, a bottle of wine and a bottle of water for less than 5€. Take you own bags as they charge for theirs. You can break up the large packets, but pay a slightly higher price. Sometimes they show both prices. There are strange bargains to be had here – we bought a Dictaphone for 20€. They have different offers on apparently random household sort of goods each week, there is sometimes a queue for the really good ones. I heard that one offer for sun loungers was swamped by local residents first thing. There is an independent Spanish-owned but English-style butcher on the seaward side. It is reputed to be good quality. The produce certainly looks good, but I haven’t tried it. They also sell eggs, bread and cheese. This supermarket is about 5 minutes walk away from Lidl, across the roundabout in the La Mosca CC. You can see it from the car park at Lidl. There’s a huge sign you cannot miss on a tall pole. Of all the Playa Flamenca supermarkets this is my own favourite. Supercor is part of the El Corte Ingles group and has a wide, good quality selection of goods, if a bit more expensive. The range of meats, fresh fish and cold meats is huge. They even have hams hanging up. They are a bit smelly! You can get fresh fruit and veg either packaged or loose - meats and cheeses too. There’s also a great display of wines, both local and international. Plus there is fresh baking - bread and cakes – this is run separately and you have to pay at the counter. The bread is great. You can also get newspapers here. Mercadona is in the urbanisation of Playa Flamenca on the N332 just south of the Alameda del Mar roundabout. To get to Mercadona from Supercor go past Flamenca Beach CC, turn left at Total Stationery and walk past the New World Chinese restaurant, go down the road to the right hand bend – go up the steps to the left, go to the end of the street and turn left - you can see the sign for the Maxx gym. Walk towards this – Mercadona is on your right. It takes about 15 minutes to get there. This supermarket is very popular and lots of people go here all the time for their shopping. This store is quite large and stocks a wide variety of food and drink. You will be able to find everything you want here, and the prices are good too. Some one told me you can get vacuum packed chickens to cook in the microwave. An easier option is to get a whole roast chicken from the van outside. These hot chicken vans cook the chickens on long spits on the side of the van. The chickens are flavoured with something really good, not sure what. When you buy one it will be put in a large foil container and cut up for you. You can eat it right away or heat it up in it’s container in the oven. Some vans also sell “chips” to go with it, these are actually potato sticks like crisps. You can also get these cooked chickens at the street market. To get to Carrefour walk round the side of Lidl past the butcher and go along the N332 northwards. It’s not really a proper footpath. You go past the Go Karts and the Asturias and you are there. It takes about 10 minutes to walk. 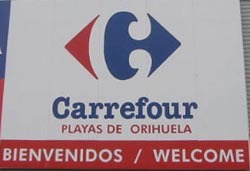 Carrefour sells a wide range of other goods such as electrical items, furniture and bedding, clothes, household goods and toiletries. Its selection of food and drink is a bit limited, but there are good prices and special offers if they have you want. From Alameda del Mar walking north on the N332 first is Lidl, then Carrefour, then Aldi. I think this is the same as Aldi in Britain. I will go in and get more local information soon. If you continue you will arrive at the Punta Prima roundabout and on the other side of it is the Punta Marina commercial centre, and 2 more supermarkets – Eroski and Plus. You will never be hungry. This is a huge new supermarket. There is a vast choice again of fresh fruit, fish, meat and cheese. They have aisles for goods from The Netherlands, UK, Germany, France etc and loads of frozen fish. Good selection of everything you need, but a bit far from home if you are carrying your purchases to El Rincon. New mini mart – Penny’s mini mart in the Flamenca Beach commercial centre. Open every day. Summer 9am to 10pm, winter 9am to 6pm. Sells many British products, food and house wares. Incorporates an English butcher – has a counter at the back – moved from Playa Flamenca beach area. This is also on the Calle Santa Alodia and is easily identified by its small café/snack bar on the pavement. In fact, you have to walk through it to continue down the street. Usually outside there are second hand books, and an assortment of holiday and gift-ish items. Inside there is quite a good range of food, drink, fresh bread, toiletries, stationery, cards etc. Quite an unusual mixture of goods actually. There is a bus timetable on the door and other interesting notices. Open 7.30am to 10pm. This mini market is inside the Flamenca Beach CC. Go in the first entrance which is alongside Maritao’s – it is on the corner on your right. This mini market is in the Citrus CC, along Calle Clementina and Calle Limon.There are loads of 2nd hand books here, they buy and sell them. They stock many British brands and again the selection of goods is quite unexpected. On some days, they have an independent supplier of knitting yarns outside.